Tired of looking for small and easy-to-use software for merging your audio files without quality loss? Need to create a cool and groovy non-stop party track without buying expensive equipment and professional audio editing applications? Are you a beginning musician in search of a simple tool to organize your records into a presentation? Puzzled by a way to send an audio greeting to your friends, relatives and all who are dear to you? Want to join audio mp3 into one? MP3 Joiner merges audio to a non-stop audio file! Look no further – our MP3 Joiner is just the piece of software you have been looking for! No confusing menus, no tricky timelines, no fancy technical terms – just drag’n'drop your favorite compositions from Windows Explorer into the program window or add them through the program dialog, arrange them in the desired order and press the “Join!” button. You can join MP3 files along with many other formats without losing a single bit of audio quality! 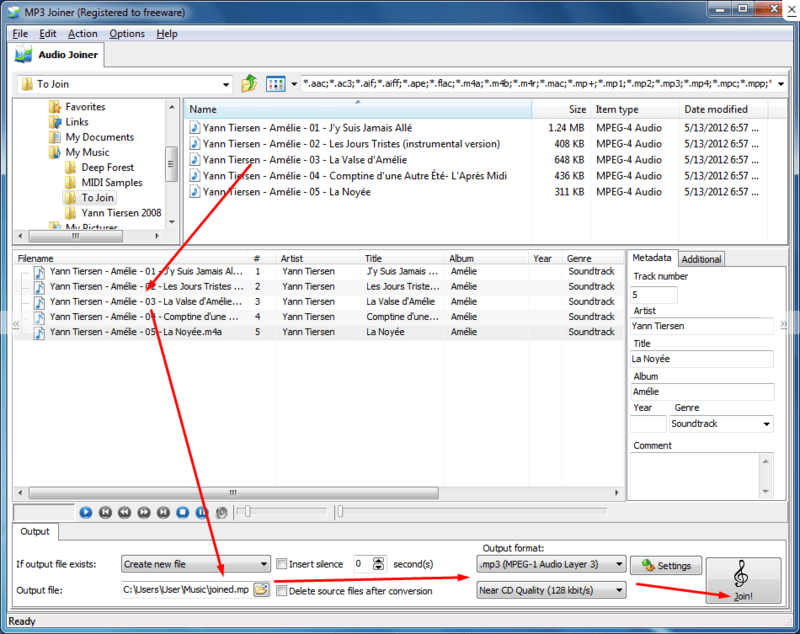 You can easily join audio files together even if they are saved in different formats. MP3 Joiner can take any number of AAC, APE, FLAC, M4A, M4B, MP3, MP4, OGG, WAV, and WMA tracks (see the complete list of supported formats below), and produce a single mp3 file in any supported format. Your source and destination formats do not necessarily need to match – as long as a particular format is supported, you can use any variety and any assortment of audio formats as input and output. This MP3 Joiner has the ability to join, merge or combine audio files with the same or different formats to mp3, mp4, wma, wav, flac, aac, m4a, ogg, aac, ac3, aiff, mp2,ofr, ofs, spx, ape, mp1, tta, wav, wma, wv, alac as source formats. Any separated audio files can be joined to the most popular audio formats as mp3, ogg, wma, wav, etc. Free download online and install MP3 Joiner on your Windows, and then follow the step by step guide to combine audio files within minutes. Here we take join mp3 as example. Step 1 Add MP3 files you want to join to this MP3 Joiner – simply drag and drop your mp3 files to the main interface of the program. Tips: Drag and drop the folder where the mp3 files are to MP3 Joiner, if you don’t want to add files one by one. Note that these mp3 files are arranged according to the play order. So if you need to exchange the location of few mp3 files, just free drag them to your wanted position. Step 2 Set the output format. If you don’t want to re-encoding, just select “.mp3 (MPEG-1 Audio Layer 3)” and “Lossless” as output format. Choose another audio format as output format if you’d like to change the target format. Step 4 Join MP3 files Simply click big “Join!” button on the lower right corner of the program to join mp3 files into one in a flash. Now you can play the joined audio files on iPod, iPhone, Apple TV, Pocket PC, PSP, Zune, Mobile phone, VCD, SVCD, DVD devices. In this article, we show an easy way to join multiple mp3 into one without re-encoding or convert the source mp3 files into other audio formats like WAV, AAC, M4A, etc. It is really worth a shot. How to uninstall MP3 Joiner? How do I uninstall MP3 Joiner in Windows Vista / Windows 7 / Windows 8 / Windows 8.1 / Windows 10? Select “MP3 Joiner” and right click, then select Uninstall/Change. How do I uninstall MP3 Joiner in Windows XP? How do I uninstall MP3 Joiner in Windows 2000? How do I access the MP3 Joiner download for PC? It’s easy! Just click the MP3 Joiner download button at the page. Clicking this link will start the installer to download MP3 Joiner free for Windows. Will this MP3 Joiner download work on Windows? Yes! The MP3 Joiner download for PC works on most current Windows operating systems. Join mp3 files online | join mp3 online | join mp3 online free | joinmp3 | mp3 merger | mp3 combiner | join music together online | join mp3 online | join songs together online | join two mp3 files online | mp3 joiner software free download | join songs online free | join two songs together online free.